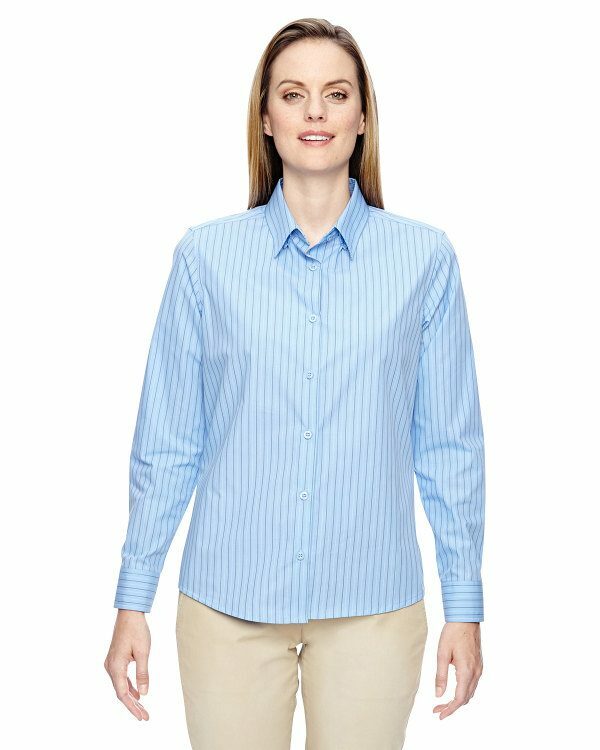 The Ash City – North End Ladies’ Align Wrinkle-Resistant Cotton Blend Dobby Vertical Striped Shirt is available in Sizes: XS-3XL and comes in the following colors: Black, Deep Blue, Light Blue and White. SKU: AB-77044 Categories: Activewear, Corporate Apparel, Women's Corporate Apparel, Woven Shirts, Wrinkle-Resistant, Women's Clothing, Outerwear, Shop by Color, Black, Blue, White Tags: women's clothing, woven shirts, wrinkle-resistant Brands: Ash City. This easy care Ladies Align Cotton Blend Dobby Vertical Striped Shirt has hidden button down collar with adjustable cuffs and is suitable for corporate uniforms, service and hospitality industries, conventions and travel wear. Our Ladies Align Cotton Blend Dobby Vertical Striped Shirt also has wrinkle resistant performance and multi-color yarn-dyed dobby stripe keeps you looking sharp from 9 to 5.